Christie welcomed visitors to the Christie Center at InfoComm 2016 last week with an authoritative fan experience using the latest products, design, and auto-calibration software solutions for sports events, live performances, theme parks, stadiums, arenas, and more, including 3D projection mapping on both large and intimate scales. The Christie all-star team delivered multi-dimensional experiences using the latest 1DLP, 3DLP, LED, camera capture, and show control technology. Christie Velvet Apex LED Tiles The outside wall of Christie Center featured the North American debut of the Apex Series of LED tiles in a stunning video wall. Part of the Christie Velvet family, Apex Series—with pixel pitches starting at 1.2 millimeters—is designed for 24/7 critical viewing applications including command and control rooms, and high security surveillance monitoring. Apex Series’ high impact visuals are also suitable for large-scale experiences, arena and stadium concourses, and corporate environments. Framing either side of the Christie Center entrance kiosk were visual displays using Christie MicroTiles on the left and Christie Velvet Merit Series indoor LED tiles on the right. Merit Series also lights the welcome kiosk itself and the welcome entrance wall. 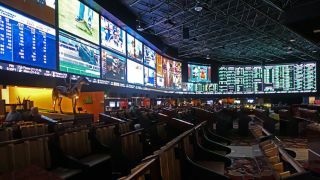 With pixel pitches ranging from 1.5 millimeters to 4.0 millimeters and producing the industry’s best fill factor and image quality, Merit Series is perfect for sportsbooks, arenas and stadiums, casinos, resorts, corporate lobbies, higher education, houses of worship, indoor signage, and artistic displays. Christie Boxer Projector Home of the Waterloo Wolves, the Christie arena returned to the Las Vegas Convention Center . Using Christie Boxer 2K30 and 4K30 projectors, the arena, using Pandoras Box, doubled as a basketball court and concert venue. Omnidirectional, the Boxer Series is a projector line designed for high-impact and large venue events. Wrapping the upper interior of the Christie Center are video screens featuring projected content from a selection of Christie 1DLP and 3DLP projectors. On the arena’s left side is the new Christie Mystique—a full suite of services, software, and hardware providing integrated solutions that remove the technological complexities and constraints associated with the design, installation, and operation of large-scale visual experiences. Christie Center guests could also visit the Locker Room, which featured both the Christie GS Series and Christie D Series delivering content onto the locker room wall. Featuring laser phosphor illumination, the 1DLP Christie GS Series provides saturated colors, and eliminates the need to replace lamps and filters while providing 20,000 hours of low cost operation. Christie Pandoras Box 5.9 and Christie Spyder X20 managed all content in the Christie Center and the new Pandoras Box V6 was previewed to visitors. Among its many new features, Pandoras Box V6 enables the user to split the workload among multiple operators by working on a common sequence or concentrate on different topics at the same time. The Pandoras Box real-time media server delivers faster and more intuitive features than ever while the Spyder X20, the industry’s leading hardware-based video processor, combines the flexibility of a universal routing switcher with integrated source monitoring.